Vitamin D supports growth & development of bone in children. Carefully balanced multi-vitamin liquid ideal for infants and young children. The Queens Awards for Enterprise Innovation 2018. No artificial sweeteners, colours or flavours. No yeast. No lactose. Suitable for vegetarians. Food Supplement UK's no 1 for babies* *UK's No 1 baby supplement brand. No other supplement for babies and young children provides such a comprehensive combination of 14 vitamins and minerals, plus Swiss Alpine Malt. UK Department of Health Recommends 1 that all children from six months to five years are given a daily supplement that contains vitamins A, C and D. Source: NHS Choices Nutritional support for infants During their early years, children's nutritional requirements are particularly high. 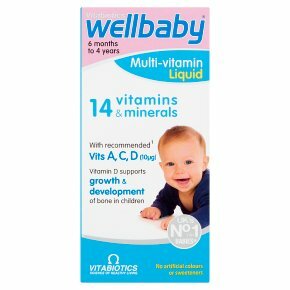 Wellbaby Multi-vitamin Liquid is a unique, carefully balanced formula, developed by Vitabiotics' nutritional experts. Wellbaby Multi-vitamin Liquid includes: Vitamins A, C and D as recommended by the UK Department of Health. 1 Vitamin D which is present in the preferred D3 form, as found in the body. Provides the recommended level of 10?g vitamin D. 2 Vitamin D which is needed for normal growth and development of bone in children. It also contributes to their normal immune system function. Iron which contributes to normal cognitive development of children. 1 Unless they are drinking 500ml (or approx. 1 pint) or more of infant formula a day, as infant formula has vitamins added to it. 2 UK Department of Health vitamin D recommendation: 8.5-10?g from birth to 1 year. 10?g from 1 to 4 years. Directions Use spoon to measure liquid, then mix into your baby's usual milk or water 6 months to 4 years: 5ml daily (1 teaspoonful) Measuring spoon included For children aged 3-4 years, the amount may be administered directly from spoon if desired. Do not exceed the recommended intake. Wellbaby Liquid may be given immediately before feeding so any residual liquid is washed off teeth and gums. Wash and dry the spoon thoroughly after use (do not use in a steam steriliser or dishwasher). This comprehensive formula replaces other Wellbaby supplements and multivitamins. There is no need to take an additional multivitamin. Shake well before use To open bottle, press & turn child proof cap. Contains no colourants of any kind. Some natural change in the liquid colour may occur after opening due to the iron content. Any spillage should be wiped off the skin. Avoid contact with clothing and fabrics which may stain.<br><br>Food supplements must not replace a varied balanced diet and a healthy lifestyle.<br>As with other food supplements, consult your doctor or pharmacist before using if your child is under medical supervision, has epilepsy, haemochromatosis, suffers from food allergies or is allergic to any of the ingredients.<br><br>Any spillage should be wiped off the skin. Those with particular sensitivity may in rare cases experience mild, temporary redness of the skin; if this occurs, a s a precaution you should discontinue further use.<br>This product contains iron, which if taken in excess, may be harmful to very young children.<br><br>Do not use if the bottle seal is broken on purchase.